Security forces have detained 27 Al-Azhar University students belonging to the Muslim Brotherhood involved in unrest during the exams that started on Saturday. Preliminary investigations charges them with rioting, chaos, violations against security forces, destruction of public property and resisting arrest. Troops arrested five people from outside the gender-segregated university on charges of assaulting security officers. Clashes have been taking place in front of the faculty of commerce on the male campus of Al-Azhar between security officers and students, who have been trying to disrupt exams for a second day. The university postponed some exams at the faculty. Fires have broken out in many facilities of the university including at a store in the faculty of Islamic studies and in an arboretum in the faculty of agriculture. Still in the male campus, some students went on rooftops and chanted slogans against the ministry of Interior as well as, "Islamic, Islamic." In the female campus in the faculty of engineering, students belonging to the Muslim Brotherhood stormed in the exams hall after an hour after the start of the exam and tore up exam papers. The administration of the university postponed the exam -- and with the help of security forces -- detained students who tore up exams. Exams took place regularly in faculties of Arab and Islamic studies and science on the female campus. Meanwhile, at the Assiut Campus of Al-Azhar University, Mohamed Abdel Shafi, the university’s deputy president, said the administration of the faculty of law has been meeting to postpone exams scheduled for Sunday. Abdel Shafi also said that exams took place in the university as scheduled in 13 faculties out of 15. He stressed that exams were rescheduled only in the science and law faculties due to disruptions. Colonel Gamal Abdel A`al, assistant to the minister of Interior, and General Nasser Hassan have ordered security forces to increase their presence at Al-Azhar University and to detain all students taking part in demonstrations and clashes. 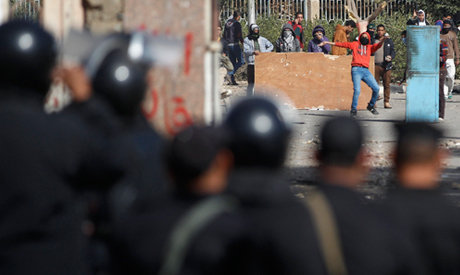 Clashes continued at the university nonetheless. Seven detained students were referred to prosecutors. A movement called "Students against Coup" related to students supporting the Brotherhood said that security forces have used rubber bullets against demonstrators. They said that there are a many injured who arrived at a field hospital in a building inside the university. A security source told Ahram Arabic, however, that security forces have not used any rubber bullets, and that they only used tear gas to disperse the students. He added that a total of 101 pro-Muslim Brotherhood students have been arrested in clashes and accused them of using weapons. On Saturday, pro-Morsi students prevented other students on campus to attend the first day of exams. However, in three leading universities -- Cairo, Ain Shams and Alexandria -- exams have been taking place despite previous clashes. Universities have witnessed numerous clashes since the new academic year commenced in October amid frequent rallies supporting former Islamist president Mohamed Morsi, who was toppled on 3 July . Because both are killing innocents. Both are attacking soft targets, both bully defenseless people. Sick minds could conceive evil and your statement is the best evidence! 27 detained? not enough! where are the rest? once again showing how peaceful they are!! These "students" just keep right on showing everyone just how they define PEACE..Maybe someone needs to donate dictionaries to the mb & their supporters so they know what the real definition of the word PEACE is..because clearly they have no idea..destruction, violence, chaos & terrorism are the exact opposite of what the word means..Apparently Peace has a totally different meaning for them when it comes to their religion & protests, at least that is what they are showing when it comes to their actions..Arrest them, Expel them & refuse them the right to enroll in any university in the country in the future. Send them & their parents the bills for repairing what they destroy & payment for all the other true students lost time because of them!! They had an opportunity most kids would love to have & they are throwing it right out the window. And this time, no little slaps on the wrist for the women either, they have proven they are criminals & terrorists just like the men so treat them just like the men!! Let them do their boo hoo crying & whining behind bars where they belong!! EGYPT & THE WORLD DOES NOT NEED MORE HATE FILLED BARBARIAN TERRORISTS LIKE THE MB OR THEIR SUPPORTERS!! The best news here is that the women who tore up the exam papers were caught.... when they are jailed, will we be treated to the "we can't treat women like that" rubbish again?? These women need to be treated no differently to the men of the MB who insist on causing as many problems as possible. As the terrorists ardent apologist and blind supporter. Your parroting the brotherhood terrorists propaganda expose one thing. ANYONE is more believable next to the Muslim brotherhood sheep. LOL,very funny and interesting to know that our "Police" statement and claim is now become words of Bible & Quran that we should believe their every statement and claim. Aren't they the same people who stripped off cloths of the woment protesters..? shall we forget the "Blue Bra" lady..? No dear we don't have so weak memory to belive police statements.Dont think All egyptian are fools or blind.